If you are looking for information on the Saskatoon franchise business opportunity, Saskatoon restaurant franchises or Saskatoon restaurants franchising, then you have come to the right place. People like things that are hard to find. There can be a sense of adventure, even romance, when it is found. From the northwestern corners of the country, we bring you fresh, cold-water salmon, clear river rainbow trout, wild game like elk, pheasant, and bear, plus interesting tastes like emu, portabella mushrooms, and other outdoor treats. Exploring the waters and the filed of the beautiful Northwest, Saskatoon offers a dining experience rich in aromas, flavors, textures and tastes. Our Saskatoon® dining lodge has re-created the look and feel of a northwest lodge, filled with beautiful pine wood ceiling beams, wall coverings, and furnishings. 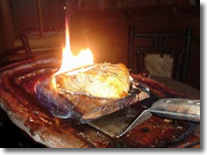 Our dining lodge has been known to give our customers a "warm, friendly escape from the hectic city life!" And each of our wild game trophies on the wall tells a story of remote mountain streams, fields and woods. The Saskatoon concept was designed not only for guest appeal, but for owner appeal as well. 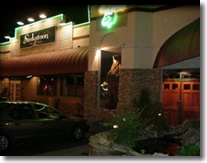 Site Flexibility - Saskatoon restaurants can be adapted for a variety of sites, configurations and locations, including freestanding, strip centers, enclosed malls and airports. The flexibility of the Saskatoon concept enables us to capitalize on non-traditional and less expensive sites in urban, small town and tourist locations. Limited Hours - Saskatoon restaurants are focused on the dinner part, operating seven days a week from 5:00 pm to 10:00 pm weekdays, and closing on Saturdays at 11:00 pm and Sundays at 9:00 pm. This focus on fewer, more intense hours is designed to provide a number of cost and labor efficiencies, and other advantages. Corporate Marketing Programs - Our unique menu and dining experience and adaptable design make Saskatoon a perfect choice for formal and informal company parties, corporate events, and dinner meetings. Over the years, Saskatoon has systematized its corporate marketing program to effectively capture this valuable business. Limited Competition - The restaurant industry is highly competitive. However, the Saskatoon concept was developed to limit direct competition by the uniqueness of its menu. Diners have dozens of choices for burgers or chicken, but when it comes to ostrich filet, buffalo steak and wild game sausages, the choice is Saskatoon! The Saskatoon franchise program provides the training and support, the systems, and the programs that enable you to establish your Saskatoon franchise in your market, and to continually strengthen your brand, presence and customer base in the years to come. We believe that our future growth lies in our ability to find motivated, quality-minded franchise owners, and to give them the systems, the tools and the guidance that will help them fulfill the Saskatoon promise in their area.